Libya: Khalifa Haftar, commander of the Libyan National Army still alive - The Maghreb Times ! 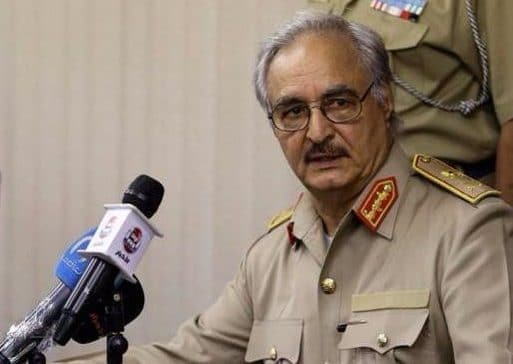 The condition of Khalifa Haftar, commander of the Libyan National Army (LNA) in the nation’s east, still remained shrouded in mystery Friday amid conflicting reports on the severity of his health situation – or any acknowledgement of a critical illness at all. By late evening, the United Nations Support Mission in Libya (UNSMIL) said it was in contact with Haftar, countering the many reports that he had died. Ghassan Salame, head of that mission, and Haftar “communicated today via phone and discussed the general situation in Libya and the latest political developments in the country,” said the UNSMIL statement. The 75-year-old Haftar is reportedly in Paris receiving treatment following a stroke, according to several sources speaking to Le Monde. Journalist Hugeux Vincent said Haftar was taken to Jordan and then transferred from Amman to Paris on April 5, according to a high-level diplomatic source within Libya’s Government of National Accord (GNA) who declined to be named. He was believed to be at Percy, a military hospital in the Paris suburb of Clamart. LNA spokesman Ahmed al-Mismari initially denied the reports and on Tuesday said Haftar – a potential candidate in Libyan elections planned for later this year – was in “excellent health” and attending to his normal duties. By Wednesday night he refused to comment, leaving Libyan media admitting their frustration in trying to report reliable information on the Haftar story. Family and friends have sealed off that information, while even those confirming the health crisis downplayed its severity or accused Haftar’s enemies of propaganda. Some accounts have said Haftar was near death, while others suggested a return to Benghazi soon. While waiting for the truth to emerge, it’s clear political fractures within his own LNA structure in the east and the tensions with the Western-backed government in Tripoli are heightened by any news of Haftar’s health.